The VWR 1350G Gravity Convection Utility Oven provides basic and efficient drying and heating capabilities with analog control. 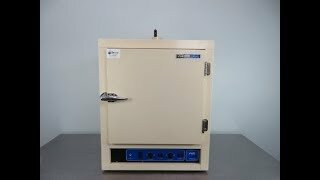 This VWR oven utilizes gravity convection, where heated air rises to the top, and circulates gently throughout even with full tray loads, making it ideal for powders and light samples. This dependable 4cu ft Gravity Convection Oven features independent hydraulic overtemperature safety and has a temperature range of 40 above ambient to 240°C, both of which can be set from the analog dial knobs. The interior is a corrosion resistant stainless steel, with adjustable shelving and an air dampener at the top that can be opened for removing humidity from samples or shut for accurate temperature heating. There are no exposed heating elements in the Sheldon 1350G, while wrap around insulation helps maintain excellent uniformity throughout. This VWR 1350G Gravity Oven has been fully inspected and reached 200° without issue. All of our lab equipment comes backed with our standard warranty. Should you have any questions about this or any of our other incubators and ovens, please don't hesitate to contact us.